This is the Ultimate Racing 3 Drawer Carrying Bags. This bag is made of heavy duty materials and strong zippers for added durability. It includes 3 uniquely sized drawers to carry a variety of R/C items. 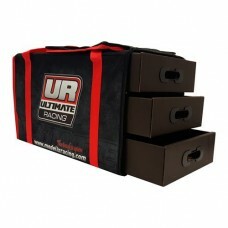 The sides of these bags feature bold Ultimate Racing branding and the top has a durable handles for easy mobility.